What is Click and Collect? How do I implement Click and Collect? What are the benefits of Click and Collect? Read on to find out more about the delivery method improving customer experience in the name of convenience: we’re helping leading retail brands achieve this with Merret. After our retail blog focus on the Ship from Store process, and the benefits of using it to fulfil orders from/through any channel, we wanted to bring you another retail process that’s in focus this year: Click and Collect. Definition: The Click and Collect concept enables shoppers to purchase items online and pick them up in the physical store, merging eCommerce and physical retail outlets together. It can often make the shopping journey more convenient for consumers: making a purchase from the comfort of their own home, and collecting the item whenever is most convenient for them, instead of paying for shipping and not being in to take delivery of the item, or waiting for their delivery to arrive. In research conducted by ourselves last year, we found that over a third of consumers enjoy the benefits of using Click and Collect and will continue to use it as their delivery method of choice. So, what are the benefits to the retailer? We’ve rounded up the industry’s top stats, to give an insight into why you should consider implementing Click and Collect into your omnichannel processes. Additional load to the store must be appreciated. Ensure that staff are trained effectively and ready to cope with the potential demand placed on stores for processing the additional Click and Collect deliveries, as well as despatching orders to the customer in store. Ensuring that there is room in the store, for example the back office, to receive and process Click and Collect deliveries. Training for upselling during the Click and Collect process is critical for making the most of Click and Collect sales uplift. For example, if the store staff scans a package and sees that it contains a black dress, they could suggest shoes or accessories to pair with it whilst at the till point. Ensuring that stores embrace Click and Collect as a cultural change rather than see it as a hindrance. As such, procedures need to be in place to ensure that the store despatching the order is credited for the sale. 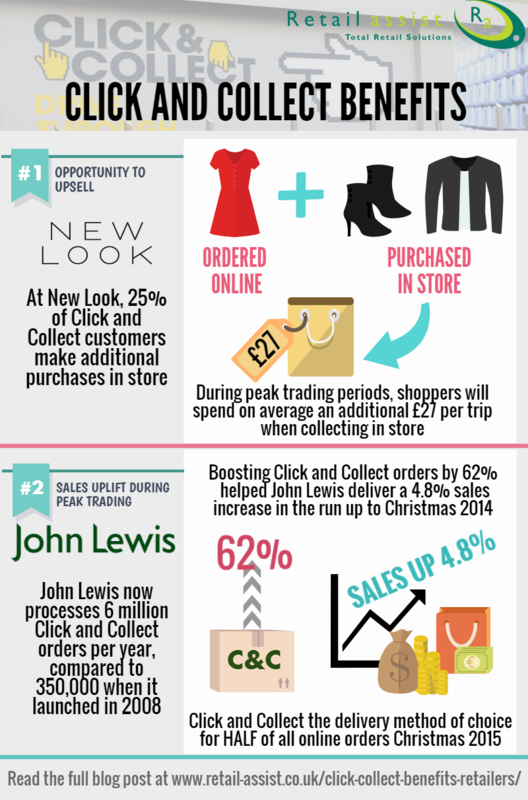 Also, incentivise store staff to hit store despatch targets in the new omnichannel culture. Retail Assist has worked hard to engineer its supply chain solution with the above points in mind. If you’d like to speak with one of our retail IT team about how to make your Click and Collect operations more time and cost efficient, please don’t hesitate to contact us on 0115 853 3910. Or, for more information about our retail IT solutions, check out our website page. Thanks very much for this informative post. You really open my understanding. Especially the point of consideration are so clear and practical. I would put them to use at my shop. Really the IT industry is making the world easy to live. You just be in your room and shop and go pick up !! Thanks very much for drawing more light on this topic.I gain more knowledge to implement in my business.